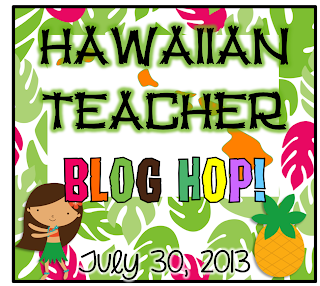 Teaching in Paradise: Monday Made It, a Peek into my Class, and a FREEBIE Bloghop Sneak Peek!! 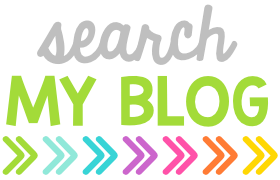 Monday Made It, a Peek into my Class, and a FREEBIE Bloghop Sneak Peek!! Tomorrow is officially my first day back at work, but I've been working throughout the entire summer changing up my classroom theme and getting it all ready for the first day. We actually don't get our students until the 5th of August, but we begin PD training and have 2 teacher work days. I am so happy for this, because this if the first time in 2 years we are getting paid to set up and train for PD. We will be heading to the Okinawan Cultural Center, and Pearl City Country Club on Thursday and Friday to learn about our new Teacher Evaluation program that is being piloted this year!! The past two years I've had a beach/ocean theme going on in my classroom. You can check those pictures out here and here. This year, I decided to switch it up...I asked my students what they'd like to see for next years theme and it was pretty unanimous that they would like RAINBOWs! SO instead of actual rainbows, I decided rainbow colors! AND..because the MR and I are really trying very hard to save money for our wedding (hopefully sometime next year! 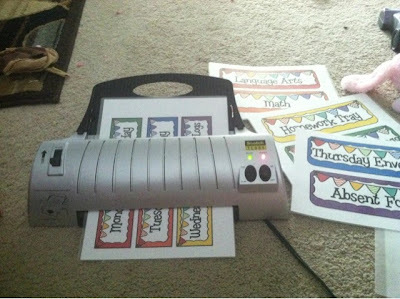 ), I decided that I would use my summer days to work on creating my own things for my classroom. I've spent many days and hours creating, editing, printing, laminating, and cutting. Here are some of the things I've made. Linking up with Tara at 4th Grade Frolics for her weekly Monday Made it! These are my labels that I used to label pretty much everything around my room. Love how they turned out! This area is where students turn in all of their work. White trays are regular class work and pink trays are for homework assignments. Some photos of my class library. I bought a TON of books this summer and also had a ton donated by some generous families who moved out of state. It took me so long to get them organized. I've finally found a set up on my bookshelves too that I like as well so that my students know exactly where to put the bins back on the shelf when they take them out to book shop. 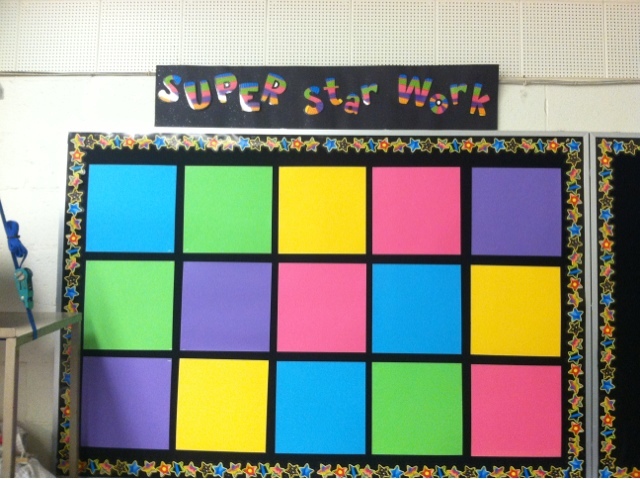 These are my two bulletin boards in the back by my library. 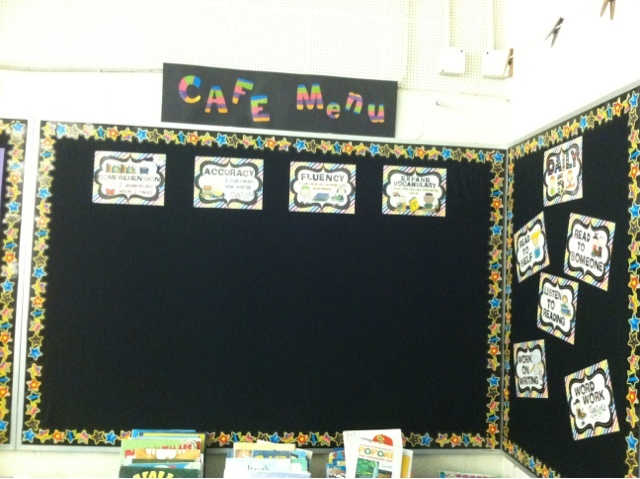 My CAFE Board...totally in love with these colorful posters from Ginger Snaps. You can pick these posters up for free in her TPT Store. The second board is where I will display student work. I love using scrapbook paper to display student work because you can easily put the work samples landscape or portrait and either way..it'll still have a nice border around it. 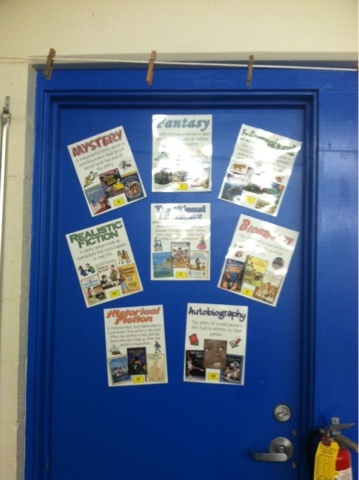 My classroom doesn't have much wall space to put things up on...so I had to resort to using the door to display my Genre Posters by the amazing Beth Newingham! 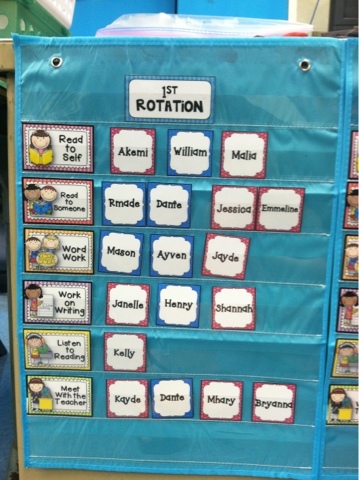 Speaking of having no room....I had NO ROOM AT ALL for my Daily 5 rotation charts! I was walking around my room today trying to figure out where I could hang my 3 charts and then I got a brilliant idea. 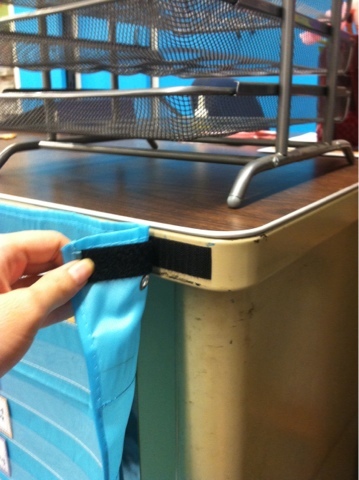 I decided to velcro them to my teacher desk. This works out perfectly because 1. My desk is pretty ugly, and 2. All students need to pass by here in order to go to their reading spots. This is what my charts look like. There are 3 charts, one for each rotation. 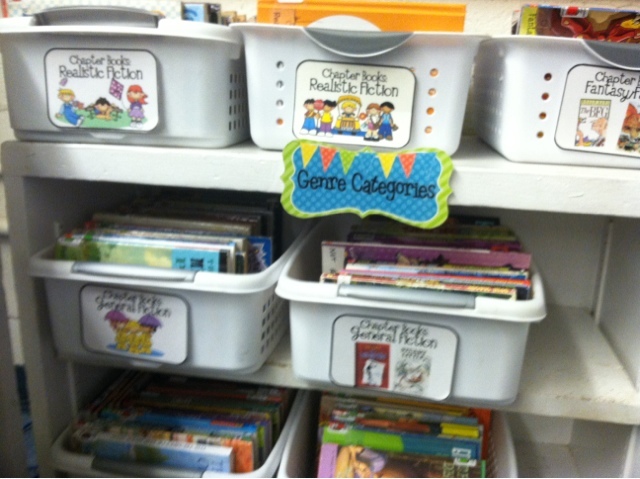 The students will be dismissed by reading groups to go and make their daily choices. 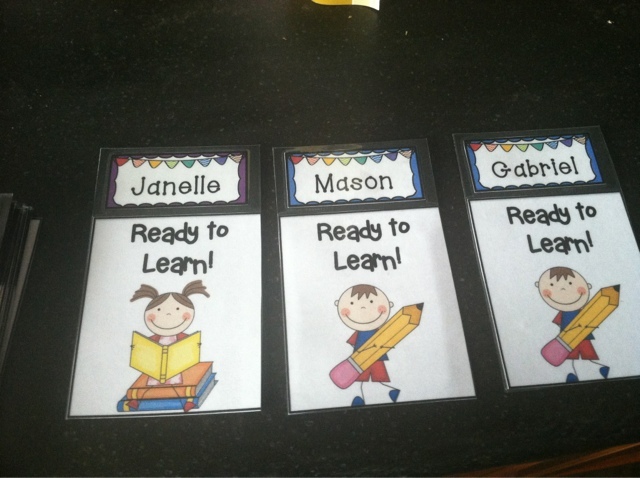 They will each have three of their name cards in their reading boxes/binders and will go and mark their choice on their way to their reading spot. Picked up those SUPER CUTE Daily 5 cards from Lori Rosenberg. I absolutely adore her work! You can find them in her tpt store as well for FREE! These charts fit perfectly across my desk! I also hopped on the Homework Club bandwagon and decided to try this out. I've always had a difficult time with student turning in their homework...so hopefully this will be some motivation! 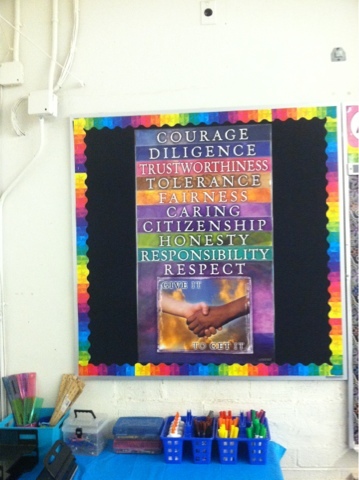 This is a board I set up for our character traits of the month. 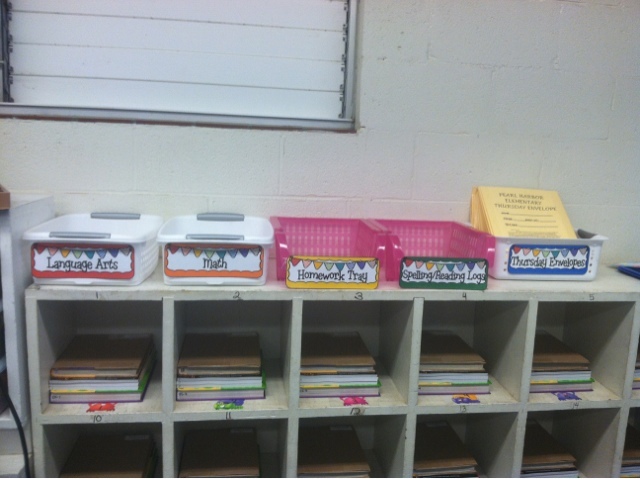 I was planning on having the kids do a writing assignment each month as to how they demonstrated that character trait. However, I found out that we weren't doing this this coming school year and just focusing on Habits of Mind instead. SO that means I'll be swapping this out tomorrow for my Math Rotations board. These are my attendance cards. They are double sided. 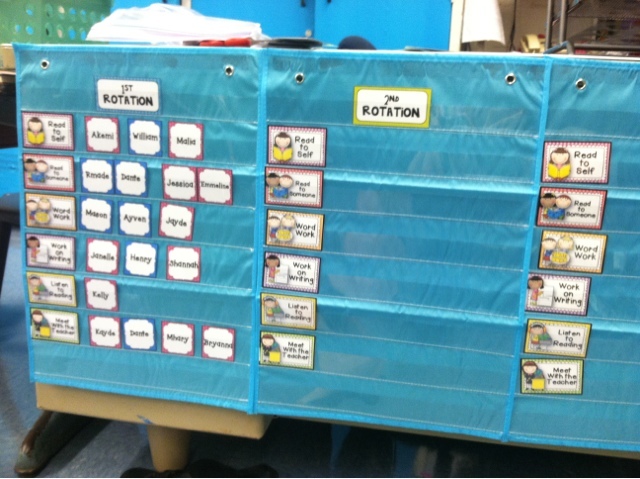 When students come in, they flip their cards over to ready to learn. When they leave for the day they flip it back to the blank side. This will be an easy way for my attendance monitor to see who is absent. I'll be sharing some final pictures as I finish up my room in the next 2 days. Until then...please come back and visit me tomorrow for a bloghop that I have planned with some amazing bloggers who also live here in Hawaii. Wow! I so enjoyed all of your pictures. 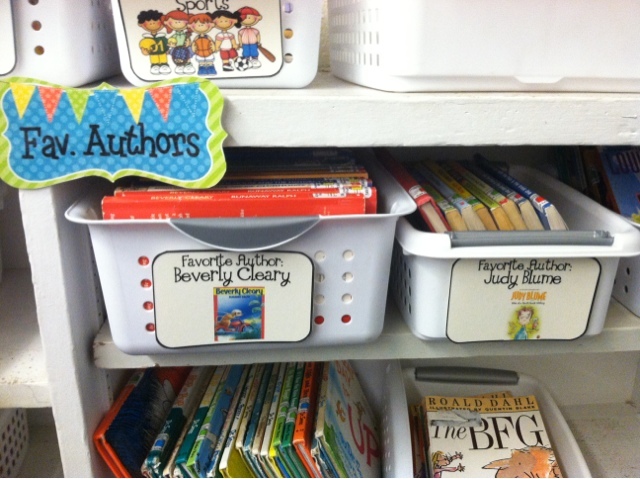 I love a colorful classroom and that's what you have! 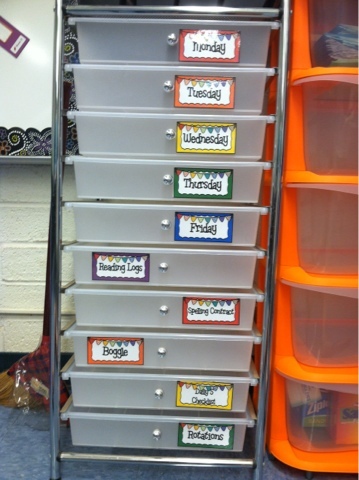 I'm so happy you were able to use my Daily 5 labels. And, I am in love with your labels with the bunting (is that what it's called?) Nice job! 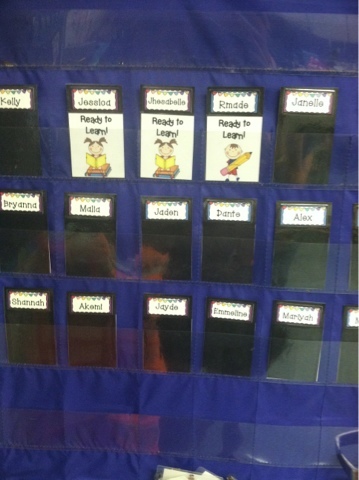 I am also digging that ready to learn attendance! Do you have those cards to share??? Can't wait for tomorrow! Should be FUN! I feel the same way! Can I have the file, too? These are perfect for what I had planned to do with having classroom dollars and paying them for doing their work each day, just like a job. This attendance system will be like them clocking in and out for work! LOVE the rainbow color theme! 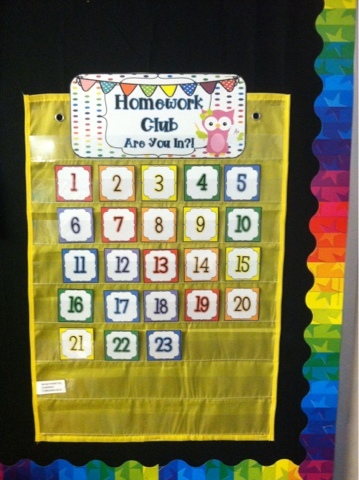 I've been thinking that I'll use the rainbow colors in my classroom, too. I'm moving to a new district; my classroom has very little wall space, lots of chalkboards. I need to brighten up the space and make use of the windows. 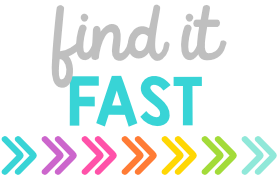 Are your labels for sale? You did a great job! 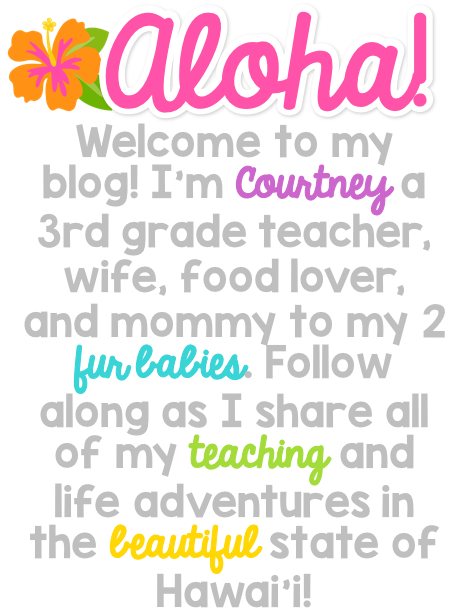 Your classroom looks great Courtney! 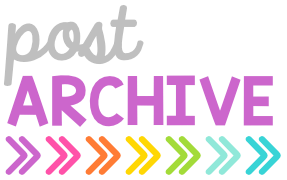 I love the rainbow theme and all of your cute labels. Where did you get your cute blue pocket charts? I need one for my Math Workshop! I hope you have a great first day back. 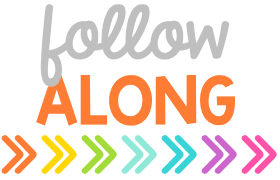 Thanks so much for linking up!! Aloha! I realize this is 5yrs later, but I just wanted to tell you that you are still an inspiration! SO MANY great ideas! Are you still in Ha? I fell in love w/ Lori’s stuff. Started following her on TpT. 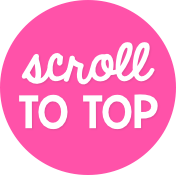 I’ll be looking for your TpT page next. I want those attendance cards and rainbow bunting. Blessings, friend! Aloha! It's a Blog Hop...Hawaiian Style! 4th of July Flash Sale! 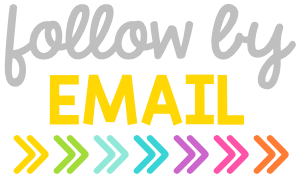 Currently: July and 50% off Lesson Plan books!! 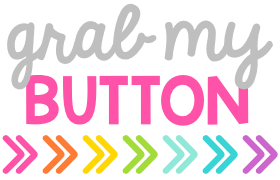 Monday Made It #2: Lesson Plan Book! !